Greetings from the pastoral staff at Door of Hope Church, we pray for our church body, and also issues that are occurring in today's world and within the church. 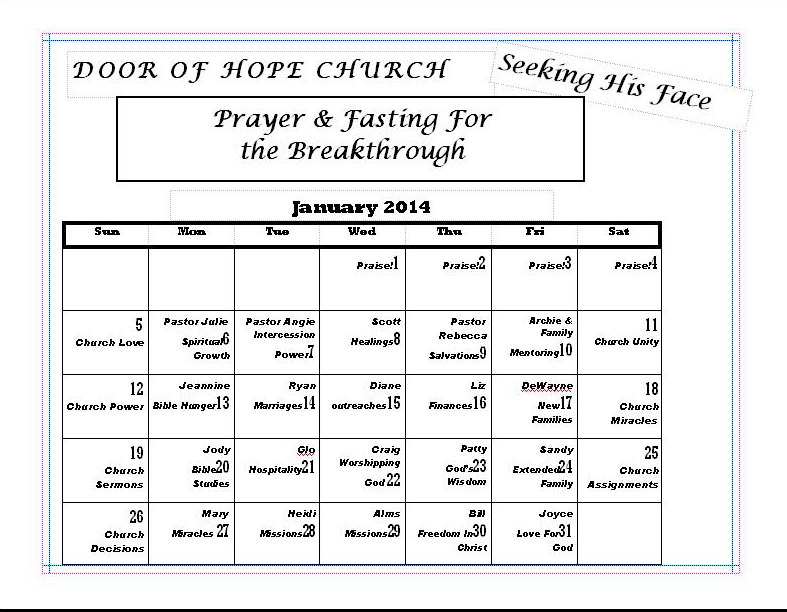 This year we want to invite you to partake in this fast. We will have helpful articles on fasting and prayer, along with podcast to help you along the week. Each week the sermons will correspond with the prayer theme. Each week we have a prayer theme that we focus on. We also pray for individuals during the week in three separate categories- those who do not know Christ (unbelievers), for deliverance and healing, and for the prodigal (those who are Christian but backslidden). "Fasting begets prophets and strengthens strong men. Fasting makes lawgivers wise; it is the soul's safeguard, the body's trusted comrade, the armor of the champion, the training of the athlete." - Basil, Bishop of Caesarea (AD 330-379). With this call to enter into extended fasts, we must prepare ourselves adequately so that the fast can honor God and fulfill its purpose. Here are some items to help and encourage you. Make your commitment and determine the length. You can fast in many different ways. Pray and ask God what he will give you faith for as far as the length of time. -A Daniel fast, with vegetables and water, is good for those carrying a heavy workload. -A fruit or vegetable juice fast allows you to enter into fasting but still gives enough energy to function. Many people have done a 40-day juice fast. Out of consideration for their health and metabolism, I would encourage teenagers to use juice and protein drinks to sustain them. If you have sugar sensitivities or problems, consult your physician before attempting this fast. -A water-only fast has been done by many people. We would not encourage this without strong medical supervision, particularly for youth. Depending on your weight and metabolism, you can go forty days on water alone. -A total fast is without water. Do not go beyond three days without water. Discuss your plans with your doctor, church leaders, and spouse or parents. We do not encourage this type of fast without specific confirmation from the Lord through your parents and church leadership. Seek advice and permission before the fast. Seek medical advice before the fast, especially if you have any existing medical concerns or conditions. If you are under 18 years of age, discuss your desire to fast with your parents. Spiritual covering, submission, and unity are important factors when fasting. Discuss your plans with your church leaders. Remember, fasting is an attitude of the heart! Ask them if they would consider fasting with you! Fast and pray in order to humble yourself and purify your worship. In fasting we are not trying to get something from God, but rather seeking to realign our hearts' affections with His. In fasting we can more readily say, "We love you Lord, more than anything in the world." Lust of any kind is perverted worship, but fasting enables us to cleanse the sanctuary of our hearts from every other rival. Don't boast about your fast. Let people know you won't be eating only if you need to (Matthew 6:16-18). Do the fast with someone else. Two are better than one! We encourage parents and kids to consider fasting together. Several generations fasting together has a powerful impact! Have a clear target as your prayer focus. Without a vision (a clear, prophetic prayer goal) the people perish. Write down your vision, so you can run with it (Habakkuk 2:2). Take time to pray and read the Word. This may seem obvious, but busyness and distractions can keep you from devotions. Reading books with testimonies of victories gained through fasting will encourage you, too. Changing History through Prayer and Fasting by Derek Prince, Fast Forward by Lou Engle and God's Chosen Fast by Author Wallis are just some of the books about fasting that are available. Expect to hear God's voice in the Word, dreams, visions and revelations. Daniel prepared himself to receive revelation through fasting (Daniel 10:1-2). There is a fasting reward (Matthew 6:18). Prepare for opposition. On the day of your fast you can bet donuts will be at the office or in class. Your spouse (or your mom) will suddenly be inspired to cook your favorite meals. Press through. Many times you may feel more tension build at home. Satan tempted Jesus on the fast, and we must expect the same. Discouragement may come in like a flood, but recognize the source and take your stand on the victory of Christ. If you fail, don't give in to condemnation. The "to fast or not to fast" dilemma can be a major tool of the enemy. Even though you may fail several times, God always extends grace. Just hit the "delete" button and continue on your fast! Breakthroughs often come after a fast, not during it. Do not listen to the lie that nothing is happening. It is my conviction that every fast done in faith will be rewarded. For people who have struggled with eating disorders in the past, fasting should be done with wisdom and caution. Fasting should not be used as a motive for weight-loss and it is important to enter back into "normal" healthy eating after long fast. The information in this handout reflects only the limited opinions, experience and suggestions of the IHOP-KC Missions Base. This handout is provided for informational purposes only and is not meant to substitute the advice provided by your doctor or other health care professional. You should not use this information for diagnosing or treating a health problem or disease, or prescribing any medication. Additionally, this information is not intended to diagnose, treat, cure or prevent any disease. These tips have been found helpful and successful, but they are no guarantee you will fast without experiencing any difficulties. You will need to do your own research, talk with health experts and experienced fasters, and continually ask the Lord for increased discernment and wisdom concerning fasting and healthy living.